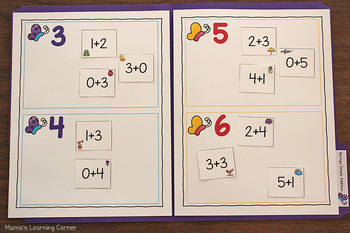 If you’re looking for spring literacy and math activities for your Preschoolers or Kindergartners, this set of Spring File Folder Games will not disappoint! You’ll find 10 different hands-on activities for your young learners, each with a fun, spring theme. **Make sure you look at the preview pictures for several examples of the games. You can determine if this skill level is correct for your students. -- Each game includes complete assembly instructions (which are VERY low-prep!). -- Instructions for play are written on the front glue-on cover. -- Each game includes a file folder tab to glue on for easy identification. ★ Spring Rhyme Time – Match each spring word with its rhyming partner. ★ Flower Families – Practice simple CVC word families, including -en, -at, -ug, -ip, -op, and -et. Match each picture card to its correct word family. ★ Color Word Watering Cans – Each watering can is a different color. Match each color word to the correct watering can. ★ Spring Sequencing – Determine what comes first, next, and last with each 3-part spring sequence. ★ Daisy Shape Match – Each yellow daisy center contains a different shape. Match each shaped leaf with the daisy center of the same shape. ★ Dragonfly Count – Count the number of dragonflies in each jar and place the correct number in the box. Contains numbers 1 through 20. ★ Springy Simple Addition – Solve each equation and place on the mat which represents its sum. Add for sums up to 6. 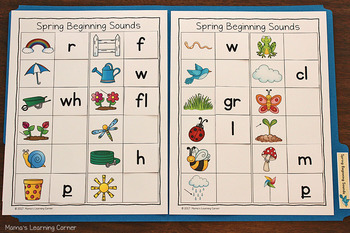 ★ Spring Beginning Sounds – Match each letter card to the picture with the same beginning sound. Includes simple beginning sounds, as well as a few blends. ★ Foods That Grow in a Garden – It’s time to start your garden! 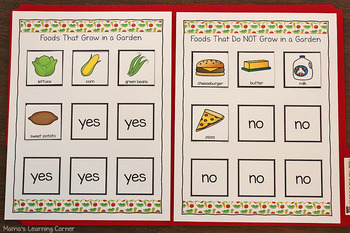 Match the foods that are grown in a garden and those that are not by placing them on the correct mats. ★ Missing Numbers – Each row has a missing number in the sequence. Find the missing number and place it on the spring picture to make the number sequence correct. 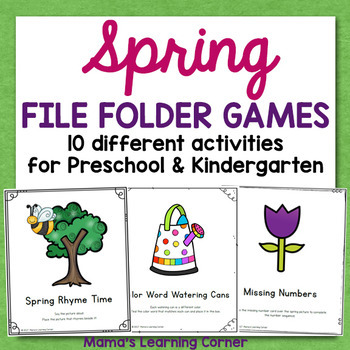 This set of spring file folder games are perfect to use in your centers, for early finishers, to use during a sub day, one-on-one intervention, or even to send home with children for extra practice. Super fun in a homeschool setting as well! ▶ Spring Coloring Pages - Create a Mini Book!